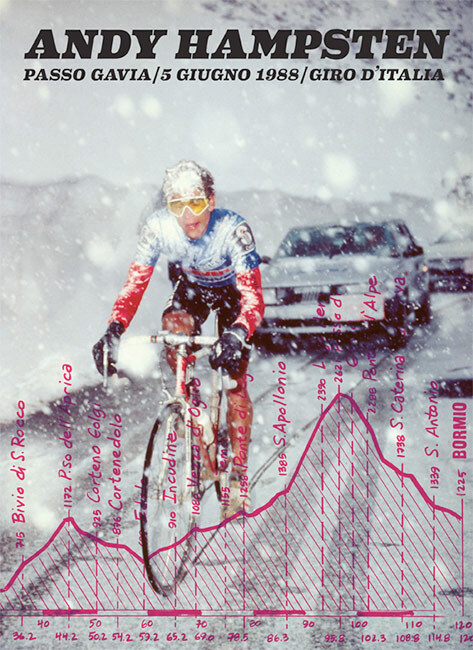 22” x 16” Poster of Andy Hampsten during the 1988 Giro d’Italia Passo Gavia. Printed on heavy archival paper (suitable for framing). This iconic photo of Andy Hampsten by Sergio Panazza is one of the few from the 1988 Giro d’Italia Passo Gavia stage, the key stage that led to Hampsten capturing the pink jersey and eventually winning that year’s tour. The poster is designed by our friends at House Industries and features the stage profile. Autographed by Andy upon request at checkout.